This post was originally written internally for our members. I’m sharing it with the rest of the triathlon world, to give some insights. Enjoy! Ironman Chattanooga is in the books, leaving just Kona on the ’15 race calendar, with regards to how RnP like to divide up our planning year. That is, we’ve historically used the end of September as the end of our calendar year, as we turn towards assessing the season, what we’ve learned, and how to apply those lessons to our primary job of always seeking to improve EN for you guys. At the same time, both of us have had a very full season of training and racing at the pointy end, managing you guy, especially around the topic of race execution, and teaching you those skills at our training camps on the Ironman courses. As a result, we have some great lessons learned and this post is the first in a series to get you all thinking about the ’16 season and letting you in on the plans we have for all of you. Below is what I’ve learned in my ’15 season. I’ve also recorded this as a video and podcast, need to figure out what to do with that. 2015 was to be my first season of seriously training and racing Ironman since 2011. I have a good swim in the closet, my bike is always at the point-end and I like to ride, but my Ironman runs have consistently underperformed. So 2015 was all about improving my Ironman run. Specifically, my swim and bike set me up well out of T2, so my run is much more about not slowing down vs running faster. I am chased, I don’t chase. My limiter has always been run durability: I have flat feet, a very lose left ankle, and had foot surgery in Feb of 2014 that kept me away from running all together until June. I made it a priority to run before both the Saturday and Sunday bikes, and played around with the length of the run and the length of the bike until I found a combination that worked. That is, at pre-bike run length of X I found that my bike was suffering, so I dialed down the run so I could still get in the bike I needed to do. I added a run to Friday, after the Thurs long run, but kept the Thurs long run at level for a long time (for me, about 1:20-30) that would still allow the Friday long run. I was ultimately able to back up a 15-17mi long run with an 7-8mi run the next day. Huge. Finally, later in the plan, I experimented with the split Thurs long runs that we talked about earlier this summer. I picked these up a little later in the plan though, but I found them to be very valuable. The net was that by running on Friday, Saturday and Sunday, I found myself running 6-7 days a week comfortably. This frequency created excellent, for me, run volume that became very sustainable over time. Back in The Day, my IM run week would be high 20 to low 30 mpw. By the end of May and into June I had racked up week after week of low to mid 40’s and did a couple 50m+ weeks in July, I think. The net is that I ran just over 1100 miles (!!) in 2015, way, way more than I have ever have before. I felt like the Forest Gump of Monrovia and was more than little tired of my local running routes. I paid more attention to meal composition and timing, though I could certainly be better and more educated about this. That is, I understand that not all calories are created equally, specifically the difference between (1) high glycemic and low glycemic carbs and (2) protein. So the loose guidance I followed was to target high glycemic carbs to before, during, and immediately after exercise. Mix with a good protein source to help me feel more full, and to do my best to not eat after 8p. If I did, it was fruit only. 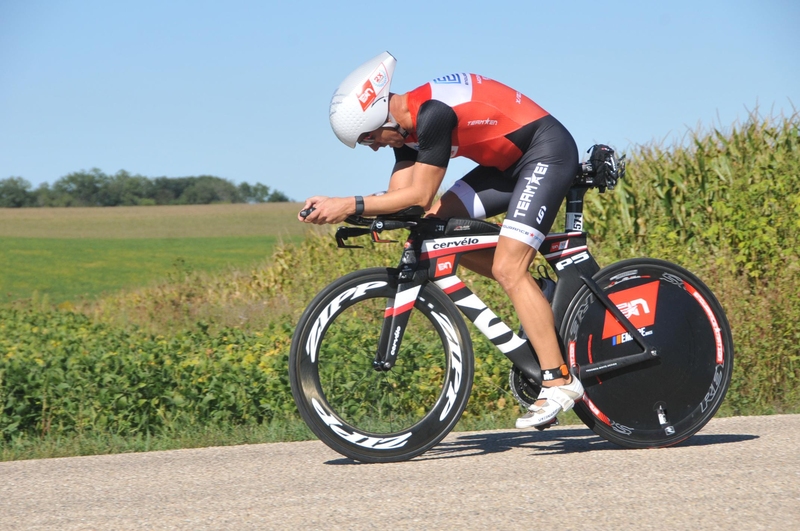 The result was I raced IMWI at about 152lb, my lightest and leanest since NCAA D3 Nationals in 1989 . I bounced the weight loss goal setting in LoseIt! nearly daily. On light-ish workout days I’d change the setting to about .5lb/wk so I could eat a bit more more and not be super hungry. On bigger days, usually the weekends, I toggled to 2lb/wk so I wouldn’t lose my mind and eat like a maniac. First, I focused more on tracking and targeting my 4-5hr / 100-112mi power vs my FTP. I didn’t quite have the OS I wanted, with respect to targeting FTP gains. And I found that super focused FTP work was tough to accommodate the running I had made my priority. Also, after bouncing around 290-305w FTP for ~12yrs, being 47yo, and having lived in the same training area for 15yrs…man, it’s tough to totally crush myself in interval work. So June-August found me TT’ing centuries, setting Pnorm goals for long vs interval rides, etc. If you followed me on Strava you saw a few 4:18-25 centuries I don’t think I had a 112mi ride that was slower than ~4:56. I crushed these rides, and myself. Second, I scheduled for myself a few key cycling weeks/weekends where I would go VERY big. These were (1) Tour of California, (2) July 4th weekend, (3) my IMWI and IMChat camps, and (4) a final epic weekend push 2wks out from race day based on the experience of Patrick doing the same for IMTX. Finally, I logged and tracked all of my workouts in Trainingpeaks, using the Performance Manager Chart to model, track, and motivate me to keep pushing the endurance ball forward by continuously lifting my Chronic Training Load (CTL). I learned a great deal by watching the charts, the evolution of my fitness, my FTP vs 5hr power, the gains I was seeing from a parallel focus on body comp, and much more. The result was that climbing was crazy fun in August and I was just stoopid fast on the flats on the tri bike. More on that below. While I was doing all of ^this^, (1) we, as a team, were having some incredible discussions around racing the bike and run with power, pace and heart rate; (2) adaptations to heat, and (3) developing, refining, and implementing race day nutrition and hydration strategies. I then had to synthesize all of this into comprehensive guidance for my IMWI and IMChat camps. By the IMChat camp I had all of this dialed as a compact, comprehensive instructional suite (?) and I applied it to the task of executing my own race in Madison…for which I owe everyone a race report . My renewed familiarity with Trainingpeaks, the PMC, and sidebar conversations with WSM Jenn Edwards prompted me to model and execute independent swim, bike, and run tapers in my final weeks up to IMWI. That is, I targeted different CTL decreases, from sport-specific CTL peaks to race day, for each sport. My started my run taper before my bike taper and really didn’t taper my swim at all. Again, I learned a lot in this process. Finally, I and a few other dorks on the squad when to All In Level 11 in finding sneaky speed opportunities for 2015. Everything from tires to tubes to tire pressure, helmets, race day apparel, bottle setup, chains…even skewers…was addressed. And that’s just on the bike! For the EN’er who’s committed to squeezing every last ounce of sneaky, smart speed out of their race day, we have some excellent guidance for you. Now, if you’ve made it this far, I’m sure you understand that each of these items is certainly it’s own independent discussion. And then PnI have a Grand Plan to how all of these learning points will be applied to the EN plans, supporting resources, our training camp schedule and curriculum, and much more. Please be patient as we drill alll of this down for you and create everything to make 2016 our best season ever!